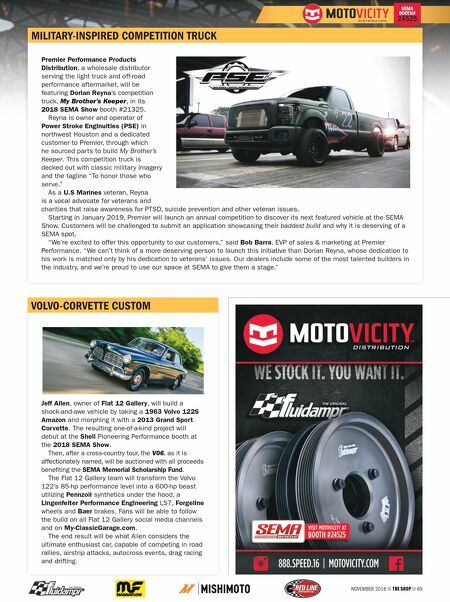 NOVEMBER 2018 THE SHOP 69 SEMA BOOTH# 24525 MILITARY-INSPIRED COMPETITION TRUCK Premier Performance Products Distribution, a wholesale distributor serving the light truck and off-road performance aftermarket, will be featuring Dorian Reyna's competition truck, My Brother's Keeper, in its 2018 SEMA Show booth #21325. Reyna is owner and operator of Power Stroke Enginuities (PSE) in northwest Houston and a dedicated customer to Premier, through which he sourced parts to build My Brother's Keeper. This competition truck is decked out with classic military imagery and the tagline "To honor those who serve." As a U.S Marines veteran, Reyna is a vocal advocate for veterans and charities that raise awareness for PTSD, suicide prevention and other veteran issues. Starting in January 2019, Premier will launch an annual competition to discover its next featured vehicle at the SEMA Show. Customers will be challenged to submit an application showcasing their baddest build and why it is deserving of a SEMA spot. "We're excited to offer this opportunity to our customers," said Bob Barra, EVP of sales & marketing at Premier Performance. "We can't think of a more deserving person to launch this initiative than Dorian Reyna, whose dedication to his work is matched only by his dedication to veterans' issues. 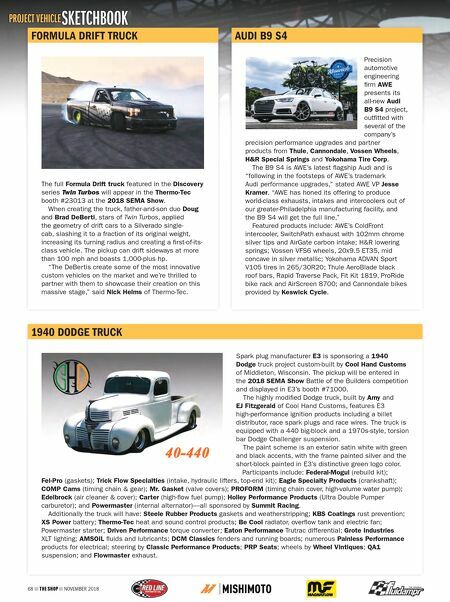 Our dealers include some of the most talented builders in the industry, and we're proud to use our space at SEMA to give them a stage." VOLVO-CORVETTE CUSTOM Jeff Allen, owner of Flat 12 Gallery, will build a shock-and-awe vehicle by taking a 1963 Volvo 122S Amazon and morphing it with a 2013 Grand Sport Corvette. The resulting one-of-a-kind project will debut at the Shell Pioneering Performance booth at the 2018 SEMA Show. Then, after a cross-country tour, the V06, as it is affectionately named, will be auctioned with all proceeds benefiting the SEMA Memorial Scholarship Fund. The Flat 12 Gallery team will transform the Volvo 122's 85-hp performance level into a 600-hp beast utilizing Pennzoil synthetics under the hood, a Lingenfelter Performance Engineering LS7, Forgeline wheels and Baer brakes. Fans will be able to follow the build on all Flat 12 Gallery social media channels and on My-ClassicGarage.com. The end result will be what Allen considers the ultimate enthusiast car, capable of competing in road rallies, airstrip attacks, autocross events, drag racing and drifting.